U.S. carrier Verizon Wireless is burning through the last of its high-capacity 32-gigabyte iPhone 5c inventory, with almost all units now out of stock in its online store, in anticipation of a replacement with Apple's next-generation lineup of handsets, AppleInsider has learned. An anonymous tipster reached out this week to claim that the carrier has "retired" the 32-gigabyte iPhone 5c. According to this person, the company plans to sell its remaining inventory and then will not replenish ahead of the anticipated Sept. 9 unveiling of Apple's fall 2014 iPhone lineup. Corroborating this tip is the fact that Verizon's online store is currently sold out of the 32-gigabyte iPhone 5c in all colors except blue. The carrier remains fully stocked with 16-gigabyte models, as well as all versions of the iPhone 5s. 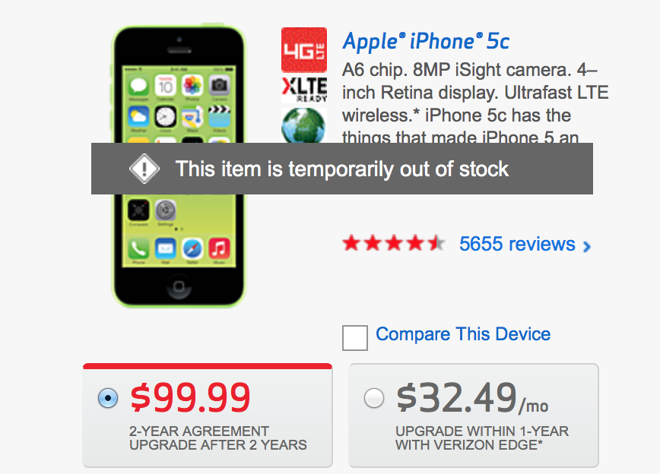 In contrast, Verizon's chief rival, AT&T, appears to have all colors of the 32-gigabyte iPhone 5c in stock as of Tuesday. The nearly-year-old handset sells for $199.99 at AT&T, but Verizon has discounted the 32-gigabyte iPhone 5c to $99.99 with a two-year commitment. Verizon is also aggressively discounting the iPhone 5s, selling the entry-level 16-gigabyte model for $99.99 with contract, 32 gigabytes for $149.99, and 64 gigabytes for $199.99. When bought through Apple, those phones are priced at $199, $299, and $399, respectively. Verizon appears to be clearing inventory ahead of Apple's anticipated Sept. 9 unveiling of the so-called "iPhone 6." But the nearly complete stock-out of the 32-gigabyte iPhone 5c at Verizon could be a sign that the model will no longer be a part of Apple's iPhone lineup going forward. 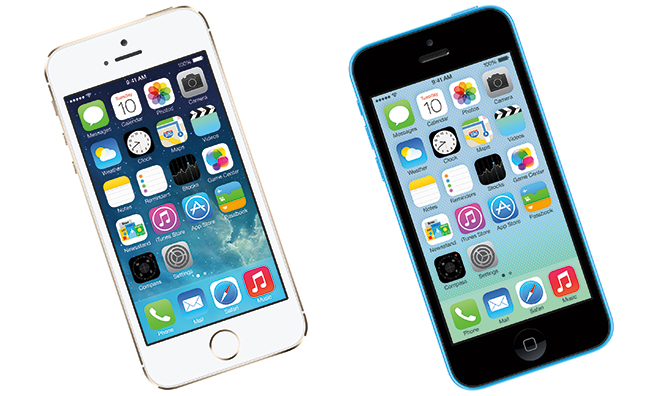 The Wall Street Journal claimed back in January that Apple would scrap the iPhone 5c this year. The mid-range model was introduced in 2013, running essentially the same components as the 2012 iPhone 5, but sporting a new plastic back that came in a colorful array of options. Apple itself has admitted that market share of the iPhone 5c was lower than the company expected it to be, a fact that critics have used to characterize the handset as a "flop." However, Apple has also revealed that the iPhone 5c has helped the company see its highest growth in the mid-range market, outpacing year-over-year growth of its higher (iPhone 5s) and lower (iPhone 4s) priced options last quarter. Verizon joins Walmart and other retailers in discounting Apple's 2013 iPhone lineup ahead of hotly anticipated new models. It's rumored that Apple's "iPhone 6" will come in two screen sizes of 4.7 and 5.5 inches, and if the company sticks to its usual release pattern, the next-generation handset will go on sale Friday, Sept. 19.